Thomas Autry Williams, 99, of Dunn went home to be with his Lord and Savior on Wednesday, February 6, 2019 at home surrounded by his family and loving Care Givers. He was born to the late Maggie Baggett Williams and Emmett A. Williams on October 21, 1919. He was a graduate of Westbrook High School in Sampson County. Mr. Williams’ career began with serving proudly in the US Navy during WWII for 33 months. At the time of his death, he was the third oldest known WW II Veteran in Sampson County. Upon returning home, he married the love of his life, Ethel Elizabeth Hairr and began a career with the Veterans Administration. He was assigned to Durham, Salisbury, and Winston-Salem, NC. 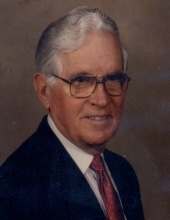 In 1956, he returned to his roots in the Sampson and Harnett County areas, working as manager and partner in the Williams Sand and Gravel Company. From his previous time in Durham, he began working part time, and later full time, with the Electrolux Cooperation, selling and servicing vacuum cleaners, earning numerous sales awards. He worked with Electrolux products into his 90’s and is still affectionally known as the “Electrolux Man”.Mr. Williams was a lifetime member of Spring Branch Baptist Church in Dunn, NC and served as a Deacon, choir and quartet member, and Choir Director for many years. He also was a member of the American Legion, the Lions Club, and the The Grange. He was a wonderful Christian with a kind demeanor and a contagious sense of humor.To his many family and friends he leaves a legacy that will be difficult duplicate or replace. He is survived by his son, Dr. Larry Thomas Williams and wife Cindy Bolick of Hickory, NC and daughter in law, Cathy Williams of Indian Trail, NC. Grandchildren, Hilary W. and Ryan Bradley, Christin W. and Heath Leggett, and Alison W. and Marshall Bullard. Great grandchildren, Holden, Cass, and Kathleen Leggett, Cora and Barrett Bradley. Also, brother and sister in law, Joseph and Joanne Williams, sister in law, Carolyn Hairr, and brother and sister in law, Graham and Amily Hairr. In addition to his parents he was preceded in death by his wife, Ethel, and his beloved son, Dennis Autry Williams. He was also preceded by his brothers Dwight, Sherrill, and Gibson, and their wives. The family will receive friends on Sunday, February 10, from 1 to 3 p.m. at Spring Branch Church. The funeral service will follow at 3:30 with Rev. Michael Worley, Rev. Jimmy Johnson, and Rev. Richard Vaughan officating. Burial to follow in the Church Cemetery. To send flowers or a remembrance gift to the family of Thomas Autry Williams, please visit our Tribute Store. "Email Address" would like to share the life celebration of Thomas Autry Williams. Click on the "link" to go to share a favorite memory or leave a condolence message for the family.